Have webs woven by LSD-intoxicated spiders ever been studied for their efficiency in fly catching? I ask, because I have a different interpretation of the experiments performed on web-weaving spiders. The famous Robert Pirsig maintains that LSD is somehow helpful to web-weaving spiders, because it makes their web more straight. Pirsig seems to imply, as I remember, that the spider is somehow more attentive to its web while on LSD. However, I maintain that it isn't the case and that it is actually the reverse. The spider is much less attentive, for it needs chaos in its web to catch the fly! A low dose of LSD has been shown to lead to larger, more regular webs. This obsessive perfection of the web comes with an increased effort and likely an increased required building time. Whether LSD-affected webs are more effective or not has not been assessed as far as I am aware. Personally I think that, if anything, larger webs are more efficient for their purpose, regardless of their enhanced regularity. I traced down the experiments with d-lysergic acid dietheylamide (LSD-25) and web-building spiders to the experiments of [Peter Witt]*1 performed in the 1950's and 60's. The original article of Witt (1951), dealing with the effects of LSD on the web building behavior of spiders (Zygiellax nohta) is not accessible to me. He reiterates on the data in a review (Witt, 1971). In this review he discusses the effect of a low dose of LSD on web building (Fig. 1). Witt concludes that low dosages of LSD increase the regularity of the webs. 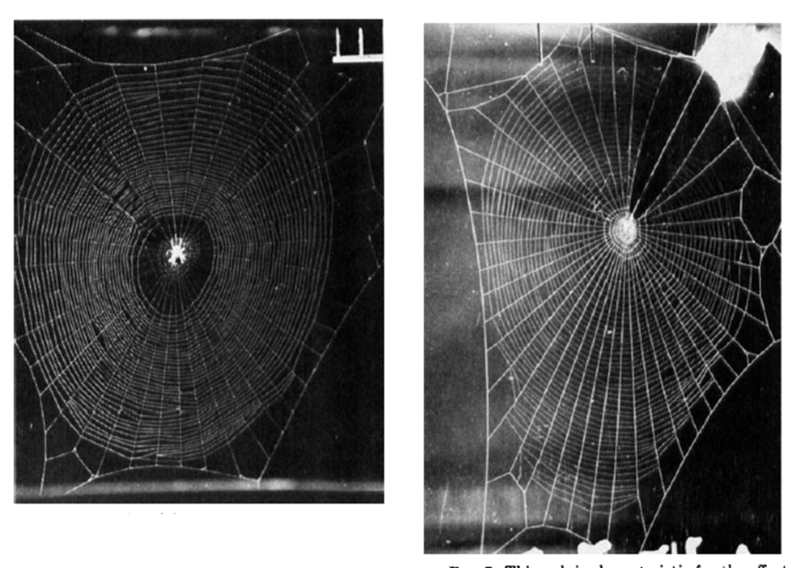 Spiders which had received less than 0.05 pg LSD-25 built larger webs, with fewer oversized angles and significantly more regular central angles. The spiral was unusually regularly spaced. He did not investigate the effectiveness of these webs (Witt, 1971). However, I reckon that because of the larger size they may be more effective. Witt notes that the normal web is far from a perfect geometric structure and that one can think of a web as a compromise between regularity, which serves to cover a wide area with a trap of a certain mesh size, and a quick construction. For example, Araneus diadematus makes a new web every morning before sunrise. It requires quite some labor producing and the webs are, arguably, structures of precision and beauty (Fig. 1). The webs take between 20 and 30 minutes to build. (Witt, 1971). The balance between regularity and quick construction of the web is what may be distorted after relatively low doses of LSD (Witt, 1971). The spider seems to put too much and almost compulsory effort in making the perfect web, and likely without too much benefit in efficiency (The Guardian, 1971). But again, the author has not addressed this hypothesis directly. Note that higher dosages of LSD (>0.05 pg) result in smaller and more irregular webs. The Guardian (1971) reproduced some figures on this (Fig. 2), showing an example of a grossly distorted and inefficient web. *Robert Pirsig is an American writer and philosopher who has not devoted his time to spiders as far as I know. Not the answer you're looking for? Browse other questions tagged neuroscience entomology pharmacology or ask your own question. Do “virgin” ant queens ever shed their wings? How much energy do small spiders expend when they are just waiting for their web to vibrate? Have there been new discoveries concerning the perception of taste for the last 10 years?